Blogs (or blog-sites, or interactive websites) are a funny thing. Some regard it as only something you do/create if you want to talk about your hobby, others (I'm one of them) regard it more and more as a marketing tool that can be used for interacting with prospects, customers, like-minded people; teaching and/or explaining readers about your products or services. And it's a marketing tool that becomes even more important when the 'blogosphere' continues its growth-rate. Various blog-conversations this week tackled/questioned the blog as tool; how to reach/teach non-bloggers to become a part of it; how to embrace 'self-promotion' through your blog (without bragging); how to 'brand' yourself as blogger - not only on your own blog, but also when commenting on other blogs. What made me stop and re-think my own blogging 'habits' was item four three on Liz Strauss "The SOBCon Next Level Quest" : Define a Vision for our Blogs. So, combining that thought (we define visions for every other business goal/aim, don't we?) with other wise tips I've decide to do exactly that for all three active blogs we/I have. Blog two: The Kiss Principle in Business, no more 'Double Dutch' in business (you've found it already) is my - as business manager/marketing director - learn/teach/tell blog. This blog started after I'd written my (first, still only but who knows) business novel, which tells 'our story' as two Dutch people struggling and slowly succeeding as retail business in Kent U.K. Besides telling remarkable good (or bad) business practise stories I encounter myself, books I read, other interesting blog post I find it was supposed to help me sell my novel. 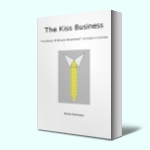 Kiss2 should become a business 'network' blog, where I or others through comments tell about business practises - self-encountered or 'read-about' in books, blogs or newspapers in order "To make business simple". Then there is my latest blog: stop/start ponderings on growing and growing pains. That's a personal blog, not really related to anything business wise, just a place where I 'ramble' around, my 'coffee-corner' which needs no redefining. I did change the lay-out a tiny bit and added the 'recent comments' category to it, just to keep in line with my overall definition of blogging: encourage conversation. Ending on that note (encouraging conversation): so what y'all think? I like the addition of the recent comments section on the sidebar. Need to get around to doing that on mine. I hope it's another simple way to encourage the ongoing conversation, the learning process and the discovery of other/new interesting blogs. Nice thought process and action steps! Thanks for the mention, Karin. You want to also remember that your blog lets people subcribe to your feed by email. I just didn't see you mention that above. But thanks for mentioning it, it's written down now anyway.